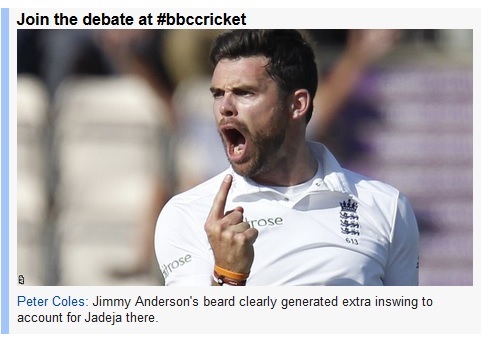 Important poll on the Beard Index for England’s cricketers..
..and India close on 112-4. The ball is starting to turn and with another 331 to win off 90 overs (3.67 an over) the odds are firmly on England’s side. UPDATE: And so it came to pass that England took India’s last 6 wickets for 66 runs in the first session of the final day to win by 266 runs. This entry was posted on July 30, 2014 at 3:52 pm and is filed under Beards, Cricket with tags 3rd Test England versus India, cricket, Southampton. You can follow any responses to this entry through the RSS 2.0 feed. You can leave a response, or trackback from your own site. The grandfather of them all is WG Grace. I remember him. He was the owner of the store in Are you being served? I don’t think he had a beard though. No, that was Gracie Brothers, the first family of Ju Jitsu.